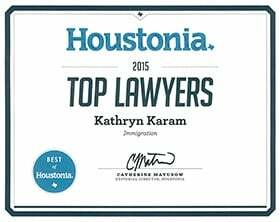 Houston Immigration Lawyer Reviews and Testimonials | The Law Office of Kathryn N. Karam, P.C. Kathryn N. Karam has over eight years of experience practicing immigration law. She is Board Certified in Immigration and Nationality Law by the Texas Board of Legal Specialization. This page features reviews from previous clients from across Texas, attesting to Kathryn Karam's dedication to every client and personal approach to immigration law. These samples of client's opinions give you an inside look into the quality of Kathryn Karam's services. Please be sure to let us know if you have any questions. "Kathryn is an outstanding lawyer, her brilliance, courage, compassion helped my family navigate through a very difficult situation and we are finally green card holders. ...Kathryn is an outstanding lawyer, her brilliance, courage, compassion helped my family navigate through a very difficult situation and we are finally green card holders. My case was a very troubled case, we had denied, revoked applications prior retaining Kathryn's help. We had been turned down by quite a few lawyers, they thought our case was not likely to be approved. But Kathryn was a fighter, she is very smart and very tough, she devised brilliant strategy to help us, when we were so scared, she calmed us down and she was able to argue her way through the immigration process. She is a brilliant fighter, she can do really hard cases where other lawyers saw no help. She got us green card when we lost our hope. "Kathryn's legal team provided excellent service and advice for my husband and I as we were working towards my US Citizenship (he is a born US citizen, me a Thai citizen) while we were stationed overseas working for one of the world's largest Oil & Gas Companies and America's third largest Corporation. Under INA 319(B) "Expeditious Naturalization for Spouses of U.S Citizens Employed Abroad" and Kathryn's guidance, we were able to complete the process of going from LPR to US citizen in 14 weeks. Kathryn is a pleasure to deal with; knowledgeable, reliable and very efficient. We received a high level of service and care from Kathryn and her team. We only had to travel to the US (Houston, TX) once for my interview and oath ceremony. Kathryn was able to get my interview 1 week in advance of the oath ceremony so we handled everything in one trip. Saved us time, money and hassle, which is exactly what we were looking for. Thanks Kathryn and team! I would highly recommend Kathryn' services to any organization or individual." "Kathryn, Nadine and all her staff are professional, responsive and caring throughout the whole process for my H1B petition. These are qualities rarely found in immigration attorneys nowadays. I submitted my H1B petition in 2014 by another well-known firm in Houston but was struggling during the process. Then I met Katie and Nadine and decided to go with them. They answered all of my questions and concerns, and assured me with a detailed plan and timeline. My case was approved a few days ago with no RFE, and thank you Kathy, Nadine and everybody. They worked hard to help all their clients because they deeply understand the current situation for immigrants. I would definitely recommend them to anyone who is facing any kind of immigration challenge. They are top notch and won't disappoint you." "I consider myself very fortunate that I found Ms.Kathryn N Karam to be the attorney for my Naturalization related procedures. Being stationed overseas for personal reasons at the time, my case had quite a few time constraints and required special paperwork. Ms. Karam and her firm helped me through all the forms, documentation and preparations for the interview, and other related proceedings in such a manner that it all turned out seamless and hassle free from my end. She is clearly an expert in her field and is a very efficient person. I will readily recommend Ms.Karam to anyone requiring professional assistance with their Immigration and Naturalization process." I had approval within 1 week! "Kathryn - and her staff - were recommended to my wife and I by my wife’s colleagues at Chevron in July 2014. We were looking to see what options we would have for a green card application and ultimately decided to go down the route of an EB11 after a nice informal chat about our options. Kathryn and Nadine worked with me closely over the next 5 months to gather all of the evidence I needed and were friendly and prompt in their responses at all times. The sheer volume of paperwork and the fine detail of the whole package was impressive to say the least. Their office submitted the documentation in January 2015 - premium processing - and I had approval within 1 week! That approval was down to the efforts of Kathryn, Nadine and the rest of their staff in making sure that the application was water tight and that I was not wasting my time. My EAD was approved in April 2015 and I am happily still working with Kathryn and Nadine while I await the approval of my AOS and Green Card. I cannot recommend this law office enough, they are friendly, efficient and clearly know their stuff, keeping me updated at all times on the status of my application." "Kathryn has helped us with both an O-1 visa and immigration for my husband. We pursued this process from overseas and our experience with Kathryn was fantastic. She promptly replied to every email and question (and we had plenty of both) which was crucial because of job related time constraints. She has a deep knowledge of immigration laws and helped through any complications. Kathryn has a strong team (Katrina, Nadine and Jessica) who all together are not just friendly and supportive but also a joy to work with. We recommend Kathryn’s office without any reservation." "An excellent law firm, I would recommend Lawyer Kathryn Karam 100% !" "When I first met Kathryn Karam, it was assisting my employer to get me out of an ICE detention center. At that point, I didn't realize how a mistake I had made 10 years before was going to continue to affect my life. Kathryn's advice at that time was that my situation needed time, but there was a possibility of citizenship down the road. Four years passed and I looked Kathryn up again. I wanted to see if enough time had passed and see what my chances were at obtaining citizenship. I was surprised that without much introduction, she remembered my name and my girlfriends as well. I knew at that moment that if anyone was going to help me, it would be her. So, as of October 1st I was sworn in as a US Citizen. Thank you Kathryn and your team. I can never repay how much you have helped me, but anyone I know who needs an immigration lawyer will be calling you!!!" "Kathryn is a very responsible and helpful lawyer. I consulted another lawyer about my EAD CARD delay issue before I turned to her. She gave me very detailed instructions and most importantly the advice she gave me really worked. Plus she ... Kathryn is a very responsible and helpful lawyer. I consulted another lawyer about my EAD CARD delay issue before I turned to her. She gave me very detailed instructions and most importantly the advice she gave me really worked. Plus she responded very fast. I am satisfied with her working attitude and profession. Thank you Kathryn!" "Kathryn Karam and her team assisted me in my naturalization application. My case was not straight forward but Kathryn was very good at clearly outlining a strategy. I dealt with her across several time zones and she even flew out to CA for my interview. She was focused and tenacious - even when first indications weren't in favor of my application, she stuck with it and continued on the outlined path. She clearly has an in-depth understanding on how the USCIS (and the immigration law) is working and what is required to build a successful case." "After a very unpleasant experience with a previous attorney, Ms. Karam and her team came in to save our day with great expertise and savvy understanding of immigration issues. From the get-go, she took the time to listen carefully about our case, did her own research and came back to us with an elaborate course of action to obtain our L-1/L-2 visas. After that first meeting, she went the extra mile to gather, evaluate and compile all the information needed, not only to file our application within a short time frame (our I-94 was a month away to expire) but also to assemble an extremely cogent presentation of our case. Everybody in her staff made us feel that every single aspect of our case was being taken care of at all times at all different levels of the firm. But the most remarkable fact was the eloquence and appropriateness of the response letter to the RFE. Right then, we knew she was fully committed to get the job done. We received our legal status in no time and are now ready to start operations of our new office in Houston. I look forward to hire her services for family and friends in the near future. Thanks Kathryn, Nadine, Jessica and Katrina! – Marlon, Adriana and Aaron." It was a pleasure working with Kathryn Karam and her office. I am very satisfied with her job"
"Hola a todos'as las personas que visitan esta pagina, mi nombre es Salvador Eduardo Lara. Yo solo les quiero compartir mi experiencia al aber contratado la firma de Kathryn N. Karam P.C. Fue una de las mejores desiciones que pude aber tomado al trabajar con esta firma de abogados.fue muy rapida lamanera que resolvieron mi caso,enmenos de lo que pense lla tenia mi permiso de trabajo y en pocos meses obtubieron mi residencia permanente por 10 anos, estoy muy feliz. su servicio fue expectacular siempre que tenia dudas o preguntas siempre me fueron resueltas al instante y claras yo se los recomiendo de verdad gracias." "I started off with a very thorough consultation with Kathryn regarding my case for NIW petition. For every question I had, she had an answer, and previous cases she has worked to support it. She took the effort to review my case from all angles to ensure that I build a string case. I walked away from our meeting confident that I made the right choice in choosing Kathryn to help me in this process. My file I-140 was approved in 3 months. Thank you Kathryn for taking the time and effort." "I did a lot of research about immigration lawyers before I started my application. Kathryn was referred by a trusted friend of mine who understands immigration law and various cases. Kathryn has done an exceptional job at providing legal advice and helping with preparation and successful outcome of my citizenship application. She was accessible all times, and responded to my questions on time with high quality. Her law firm demonstrated exceptional professionalism and strong understanding of the process, questions and key areas associated with my application. I would highly recommend her and her law firm for immigration services." I was for professionalism.. and I found. "My case was very simple (she took over a previous attorney for a green card case completion), but she managed to provide the information I needed, promptly and thoroughly, and helped getting to the end in the best way." A Step Above the Competition!!
" I met with Ms. Kathryn Karam at a professional networking event where she made a presentation of her services. At the time, I had already committed and in the US Residency application process with another attorney, but I was not satisfied and started to worry. I fear that my application was too slow, clumsy, and lacked professional drive. After I presented my case to Ms. Kathryn Karam and we decided to work together, things changed 180 degrees. It became precise, organized, with the right timing and connections to the US Authorities. I felt relived, started to trust the process and I became confident in the outcome. Ms. Kathryn Karam acts proactively to manage any situation and she provides regular feedback. She is professional, efficient, focused, to the point and she knows the system. It is easy for me to recommend Ms. Kathryn Karam for her work." "Kathryn helped us resolve a long-standing Petition to Remove Conditions for my spouse's green card. The conditions were still in place long after the original two year time frame, despite all of the paperwork being correct. She did an excellent job and got us a very favorable outcome. She is easy to work with, very caring, and professional. She answered all of our questions and we felt well prepared going into the interview." Thanks to Kathryn helping me to get my green card after failing the green card interview. "Kathryn Karam and her team assisted me in my naturalization application. My case was not straight forward but Kathryn was very good at clearly outlining a strategy. I dealt with her across several time zones and she even flew out to CA for my interview. She was focused and tenacious - even when first indications weren't in favor of my application, she stuck with it and continued on the outlined path. She clearly has an in-depth understanding on how the USCIS (and the immigration law) is working and what is required to build a successful case." " After a very unpleasant experience with a previous attorney, Ms. Karam and her team came in to save our day with great expertise and savvy understanding of immigration issues. From the get-go, she took the time to listen carefully about our case, did her own research and came back to us with an elaborate course of action to obtain our L-1/L-2 visas. After that first meeting, she went the extra mile to gather, evaluate and compile all the information needed, not only to file our application within a short time frame (our I-94 was a month away to expire) but also to assemble an extremely cogent presentation of our case. Everybody in her staff made us feel that every single aspect of our case was being taken care of at all times at all different levels of the firm. But the most remarkable fact was the eloquence and appropriateness of the response letter to the RFE. Right then, we knew she was fully committed to get the job done. We received our legal status in no time and are now ready to start operations of our new office in Houston. I look forward to hire her services for family and friends in the near future. Thanks Kathryn, Nadine, Jessica and Katrina!" – Marlon, Adriana and Aaron. Ms. Karam is a highly knowledgeable attorney who gets results. "After a very unpleasant experience with a previous attorney, Ms. Karam and her team came in to save our day with great expertise and savvy understanding of immigration issues. From the get-go, she took the time to listen carefully about our case, did her own research and came back to us with an elaborate course of action to obtain our L-1/L-2 visas. After that first meeting, she went the extra mile to gather, evaluate and compile all the information needed, not only to file our application within a short time frame (our I-94 was a month away to expire) but also to assemble an extremely cogent presentation of our case. Everybody in her staff made us feel that every single aspect of our case was being taken care of at all times at all different levels of the firm. But the most remarkable fact was the eloquence and appropriateness of the response letter to the RFE. Right then, we knew she was fully committed to get the job done. We received our legal status in no time and are now ready to start operations of our new office in Houston. I look forward to hire her services for family and friends in the near future. Thanks Kathryn, Nadine, Jessica and Katrina!" – Marlon, Adriana and Aaron. A Step Above the Competition!!! Disclaimer: This website was created to provide general information on immigration matters and is not intended to substitute legal counsel. Only a licensed Texas immigration lawyer can provide you with official legal counsel based on the unique details surrounding your situation. Since the smallest details regarding your status and background can impact the avenues open to you, a qualified attorney can provide you with counsel after reviewing your case.